Right I'm afraid it is time for us to say 'au revoir'. But don't worry! More European football action will be heading your way soon - and you will not want to miss it. It is Champions League semi-final time! Make sure you join us on Tuesday when newly-crowned Italian champions Juventus host holders Real Madrid, before Pep Guardiola returns to Barcelona with his Bayern Munich side on Wednesday. Do. Not. Miss. See you then! First-half goals from Edinson Cavani and Blaise Matuidi mean Paris St-Germain have won six Ligue 1 matches on the bounce. Another three victories and the trophy will be returning to the Parc des Princes for the third successive season. And Laurent Blanc's men can even afford a draw and still pip Lyon. The PSG players fistpump and hug each other in celebration as referee Ruddy Buquet toots his final whistle. The Parisians reclaim their three-point advantage over nearest rivals Lyon at the top of Ligue 1. Here is the fourth offficial, who is armed with a big electronic board. A number four flashes up, telling us that there will be a minimum of four minutes stoppage time. Another goal for PSG would end any lingering Nantes hopes of setting up a grandstand finish. Edinson Cavani, moments after being flagged offside when clean through, tees up Adrien Rabiot. But the brilliantly-named Nantes defender Papy Djilobodji races across to cut the ball and concedes a corner. PSG boss Laurent Blanc makes a late change as Javier Pastore is withdrawn for Ezequiel Lavezzi, who was left out tonight despite scoring a hat-trick against Lille last weekend. Not a bad substitute to have up your sleeve. Andrew Priestley: This is a very big win for PSG tonight, they're under some serious pressure to win the title after their European failings. Well it took a while but Napoli finally made their numerical advantage count. Milan were reduced to 10 min with just 50 seconds on the clock and held out until the 70th minute. But Rafa Benitez's men turned the screw to earn a comfortable win and move within four points of third-placed Lazio with four matches left. The race for the Champions League is on! Two minutes of stoppage time in Naples. And the home side almost net a fourth. Belgium international Dries Mertens is allowed a criminal amount of space on the edge of the Milan box, picking his spot with a curler. But Milan keeper Diego Lopez throws himself across to save. Free-kick in a dangerous position close to the right touchline for Nantes. The big lads from the back saunter forward, packing the PSG penalty area. Oh dear! They get nowhere near the ball as a poor delivery from Remi Gomis is met by the forehead of Zlatan Ibrahimovic at the near post. Half a chance for Nantes. A high ball is pumped into the PSG six-yard box from the left flank, with two yellow shirts bearing down on away keeper Nicolas Douchez as he leaps to gather. The Frenchman stays strong to claim at the second attempt. As you can tell by the diminishing frequency of entries from France, there is not much happening in Nantes at the moment. PSG have eased off the gas a touch, but the as-it-stands leaders do not look like being troubled by a toothless Nantes side. OptaPaolo: Marek Hamsik has scored in back-to-back Serie A games for the first time since August 2013. Milan have collapsed quicker than a pack of cards. Napoli's Manolo Gabbiadini - no relation to ex-Sunderland and Derby hero Marco - back heels into the away net. There was an element of fluke to that goal - no wonder Gabbiadini barely celebrates. Game, set and match. Argentina striker Gonzalo Higuain doubles Napoli's advantage over 10-man Milan, collecting Dries Mertens cut-back to take a touch before steering into the bottom corner. And Marek Hamsik shows exactly what that goal means by ripping off his shirt in wild celebration. Napoli still in the hunt for Champions League qualification remember. Breakthrough for Napoli! The home side's numerical advantage finally tells - and it has been coming. Napoli skipper Marek Hamsik is the man who does the damage, pouncing on a loose clearance to expertly guide a first-time shot from 20 yards into the bottom right corner. Beautiful finish from the Slovakian. Barely seven minutes since the restart and PSG boss Laurent Blanc decides to make a change. Off comes goalscorer Blaise Matuidi, with young France midfielder Adrien Rabiot taking his place. One presumes that is because of an injury suffered by Matuidi. Zlatan Ibrahimovic might not have stuck his name on the scoresheet (yet) but he has caused a nuisance of himself on more than one occassion. The Swede looks to latch onto Edinson Cavani's header in the penalty box and tumbles under a desperate challenge from Issa Cissokho. No penalty. The 22 players who began the match all return from the changing rooms at the start of the second half. Nantes have the proverbial mountain to climb if they are going to stop PSG claiming a sixth straight Ligue 1 win. Napoli are within the width of a post from turning Rafa Benitez's frown into a smile. Skipper Marek Hamsik flicks goalwards from close range, but sees his improvised effort bounce off the post and away to safety. Monaco cruised to a 4-1 victory over Toulose to strengthen their grip on third place and a Champions League spot next season thanks to goals from Anthony Martial, Bernardo Silva, Joao Moutinho and Valere Germain. Meanwhile, On-loan Liverpool striker Divock Origi scored his eighth goal of the season as Lille kept alive their hopes of a Europa League with a 3-1 win over already-relegated Lens. I can't see this impressive record not being stretched tonight - can you? Back under way at the Stadio San Paolo. Napoli straight into AC Milan's half and playing with a lot more purpose. One minute of added time passes pretty uneventfully before referee Ruddy Buquet brings Nantes' misery to an end. For 15 minutes at least. Accomplished display from the defending champions, who are bidding for a third straight title. Goals from Edinson Cavani (we think) and Blaise Matuidi (we know) are set to move Laurent Blanc's men three points clear of title rivals Lyon. PSG keeper Nicolas Dochez has barely broken into sweat tonight. But he needs to be alert to claw away a header that was sneaking into the far corner. While you're enjoying your half-time biscotti here's a reminder of what happened in Serie A earlier today. Roma climbed above city rivals Lazio and into an automatic Champions League place after a 2-0 victory over Genoa at the Stadio Olimpico. Seydou Doumbia and Alessandro Florenzi both found the net for Roma. Lazio slipped down to third spot - a point behind Roma - after they were held to a 1-1 draw at Atalanta. Marco Parolo equalised for Lazio after ex-Lazio defender Giuseppe Biava had put Atalanta ahead. Josip Ilicic's brace helped Fiorentina boost their hopes of a Europa League place with a 3-1 win over Cesena. Fiorentina move on to 52 points and are now up to fifth, two points above Genoa, and three points above eighth-placed Inter Milan, who drew 0-0 with Chievo. Veteran Antonio Di Natale gave Udinese a 1-0 away win over Hellas Verona. Nantes have showed plenty of endeavour - but little quality. However, they almost pull one back when Venezuelan defender Oswaldo Vizcarrondo rises above marker Thiago Silva to head narrowly over the PSG crossbar from a home corner. Paris St-Germain are looking like they could score a hatful tonight - if they want to. Only the raised offside flag from the linesman stops Zlatan Ibrahimovic and Blaise Matuidi almost adding to the tally. Nantes have only scored 27 goals in their 34 previous Ligue 1 games this season. If that stat doesn't tell you the size of the task facing them now, then I don't know what does. What was I saying about Nantes still being in the game? Not any more, I would respectfully suggest. PSG make their dominance count as Zlatan Ibrahimovic perfectly times his pass to the on-rushing Blaise Matuidi, who is allowed a free run from deep to fire in the second. The spiky-haired Marek Hamsik drags a long-range effort past the post shortly while Gonzalo Higuain curls over from a good position as Napoli look to finish the half strongly, but it remains goalless at the break. Will Napoli be able to make the extra man count in the second half as AC Milan start to feel the strain of playing with 10 men. PSG could have racked up a rugby score by now. But while they only have a slender one-goal advantage, the home side are well in with a shout. Nantes press forward again, giving PSG's defence some food for thought. Home forward Johan Audel whips an effort over the away crossbar, before team-mate Jordan Veretout also fails to find his range. Remember that old adage about a team being better with 10 men? Well, AC Milan have just carved out their best chance of half. Salvatore Bocchetti's delightful cross from the left picks out Giacomo Bonaventura who climbs high and heads the ball against the post. A let-off for Napoli. End-to-end stuff at a noisy Stade de la Beaujoire-Louis Fonteneau. Nantes man Remy Riou has been the busiest of the two keepers and is needed again to stop Javier Pastore's low angled shot. Signs of life from the home side as they look to peg back the defending champions. Togo striker Serge Gakpe shows good movement to dash towards the near post and flick a header towards the PSG goal. But away keeper Nicolas Douchez is perfectly positioned to save. The Napoli fans are getting a little irritated and jeers and groans around the stadium after Brazilian Jorginho fires high and wide into the stands. Argentine striker Gonzalo Higuain is making some intelligent runs but so far the AC Milan defenders have kept a close eye on him. BBC World Service's John Bennett: Edinson Cavani - 7 game goal drought, followed by a run of 7 goals in 7 games. Famine to feast. Another Edinson Cavani chance, another Remy Riou save. These two are having a match between themselves at the moment. Zlatan Ibrahimovic is allowed far too much to turn inside the Nantes half, taking his time to pick out the run of Cavani in the left channel. But the Uruguayan's touch is a little heavy, allowing Riou to race off his line and smother. The Nantes corner comes to nothing before Alejandro Bedoya attempts to turn provider down the right flank. But his centre is far strong and evades the waiting yellow shirts in the PSG box. And then PSG counter. Marco Verrati's slick pass slices open the home defence, putting Edinson Cavani clean through. The Uruguayan gives the eyes to Nantes keeper Remy Riou - who doesn't buy it and stands up to block. AC Milan have won a couple of free-kicks in dangerous positions but the Napoli defence have stood firm. Still goalless at the Stadio San Paolo on the half-hour mark. This is better from Nantes. A dangerous ball is swung in from the left towards Alejandro Bedoya - the pacy USA winger who you may remember impressed at last summer's World Cup - who leaps up at the far post. 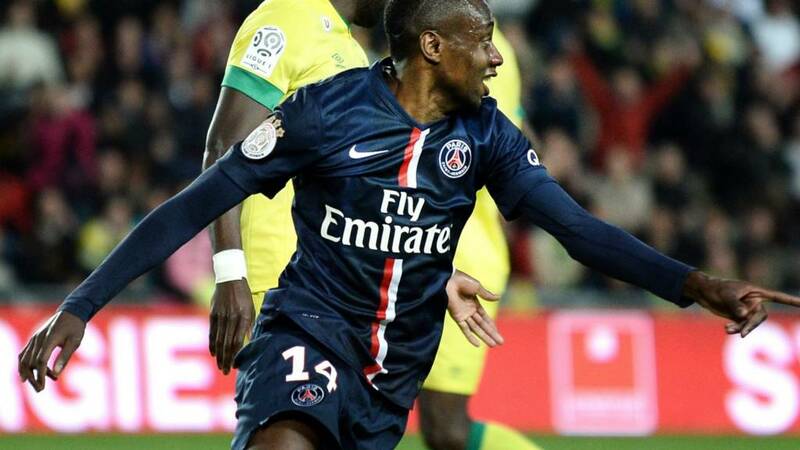 But he is beaten to the ball by PSG midfielder Blaise Matuidi, who nods out for a corner. Good defending. The Nantes supporters find their voice quickly as they aim to push their team forward in search of an instant reply. They are noisy bunch - reminding me a lot of Borussia Dortmund's passionate support. But their enthusiasm is not being matched by their on-field heroes. A rare attack from the home side is easily snuffed out by PSG. This has silenced the home crowd! PSG come flying out of the traps and bag an early opener as Edinson Cavani, possibly with the help of team-mate Gregory van der Wiel, fires in. A man down but AC Milan haven't parked the bus - or should that be dustbin lorry given the much-publicised trouble with litter in Naples? - and have still been positive going forward. Napoli goalkeeper Mariano Andujar has his palms stung by a fierce drive by Giacomo Bonaventura from long range. The home fans are creating plenty of noise as they hope to see an upset tonight. OptaPaolo: Mattia De Sciglio's red card after 50 seconds is the fastest in this Serie A season. It could be a dramatic night in the Ligue 1 title race and we want to share in the excitement of watching the talents of Zlatan Ibrahimovic, Edinson Cavani, Ezequiel Lavezzi et al. So, please, don't be shy with your views. How do you see the French title race panning out? Where will PSG and Lyon drop points in the next few weeks? Who deserves to be champions and why? Tweet using #bbceurofooty or text 81111. Allez! Allez! Allez! The league titles in Germany, England, Holland and Italy are now all done and dusted. But across the channel in France we could be in for a thrilling climax to the season. Paris St-Germain have won five out of their last five and appear to be confidently marching towards a Ligue 1 title-winning party at the end of the season. But Laurent Blanc's side know that if they slip up in their remaining four games that the championship race is blown wide open. Lyon beat Evian 2-0 at the Stade Gerland yesterday to regain top spot in Ligue 1 and heap all the pressure back on PSG ahead of tonight's trip to Nantes. Can the defending champions hold their nerve? That missed penalty means no change in the table for now. Here's how things looked before kick-off. What drama! Napoli striker Gonzalo Higuain is forced to wait for a good couple of minutes as De Sciglio is marched off the pitch and down the tunnel. Nervous times for the Argentine, who then sees his low spot-kick brilliantly saved by Milan keeper Diego Lopez to his right. Oh yes it can get worse for Milan! FORTY-FOUR seconds are only on the clock before a clumsy tackle from Mattia De Sciglio hands a penalty to the home side. Remarkable. Game on in Naples. Milan playing for pride - things surely can't get any worse for the Rossoneri? wrapped up the Serie A title yesterday - their fourth straight Scudetto - with a 2-0 win over Sampdoria but the race European places is still very much alive. Earlier in the day Roma beat Genoa 2-0 to move a point above city rivals Lazio, who drew 1-1 with Atalanta, into second place and an automatic Champions League place. Napoli still have ambitions to catch Lazio and nick that third spot in European football's elite competition, but are fast running out of games. Rafael Benitez's side are seven points behind with five games of the campaign left. Victory against AC Milan tonight will be essential to mount a late charge. While our focus will be firmly on PSG tonight, we will also be letting you know what is going on in Italy where Napoli host AC Milan. Rafael Benitez's side are chasing a top three finish - and Champions League qualification - while fallen giants AC Milan are fighting for a top-half finish. How times have changed. So with the Swede returning, PSG coach Laurent Blanc's dilemma was deciding which of in-form trio Javier Pastore, Ezequiel Lavezzi and Edinson Cavani would make way. The answer? Lavezzi. PSG XI: Douchez, Van der Wiel, Silva, Marquinhos, Maxwell, Verratti, Motta, Matuidi, Pastore, Ibrahimovic, Cavani. Zlatan, if you weren't aware, has missed PSG's last three matches after being suspended for a foul-mouthed rant at the French football authorities. But now he is back and unsurprisingly has managed to squeeze back into the side for the trip to mid-table Nantes. The Parisians are currently second behind Lyon on goal difference, but can restore a three-point advantage with a win at the Stade de la Beaujoire tonight. Guess who's back? Zlatan Ibrahimovic has swapped the leather jacket for a football shirt. And the designer shades have been left in the changing room. The PSG superstar is back from suspension and has another Ligue 1 title to win.